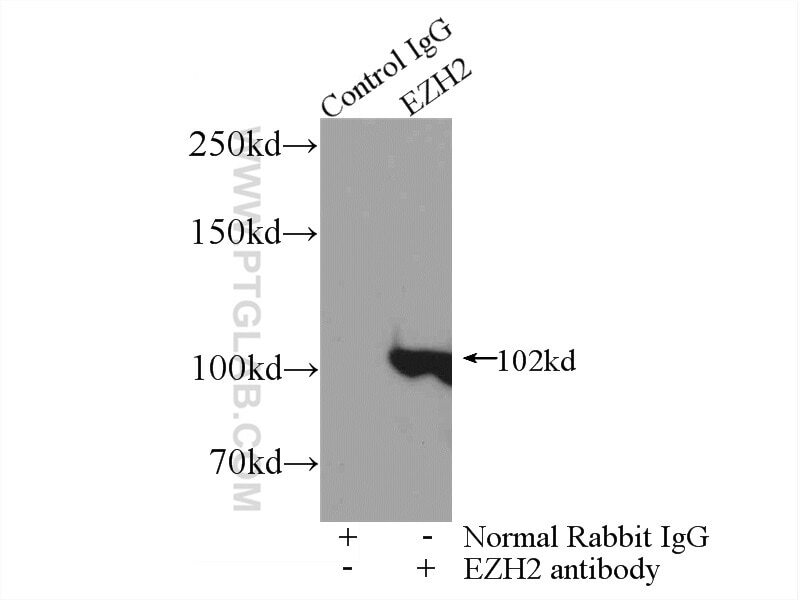 IP Result of anti-EZH2 (IP:21800-1-AP, 4ug; Detection:21800-1-AP 1:1500) with HepG2 cells lysate 4000ug. This antibody is not suggested for IHC test. The long non-coding RNA PVT1 represses ANGPTL4 transcription through binding with EZH2 in trophoblast cell. Epigenetic silencing of tumor suppressor gene CDKN1A by oncogenic long non-coding RNA SNHG1 in cholangiocarcinoma. Long Non-coding RNA PVT1 Promotes Cell Proliferation and Migration by Silencing ANGPTL4 Expression in Cholangiocarcinoma. CUL1 promotes breast cancer metastasis through regulating EZH2-induced the autocrine expression of the cytokines CXCL8 and IL11. Identification and Functional Characterization of a New Splicing Variant of EZH2 in the Central Nervous System.